Not just a walk in the woods. "The Japanese, who have been at this sort of thing a lot longer, call the experience of stress reduction in natural surroundings "forest bathing," or shinrin-yoku. I read in a news report that "Japanese scientists have discovered that the scent of trees, the sound of brooks and the feel of sunshine … can have a calming effect …" It takes funded research to discover the glaringly obvious? True, there is further evidence that essential wood oils called phytoncides, which are natural preservatives and fungicides emitted by many plants, can actually increase natural killer cells in humans, thus enhancing the immune system. I don't know whether this is in any sense true, but it doesn't really matter, and if they want to call it "forest bathing" why should we quibble? It may be not so much that forests are healthy, but that cities are not. You can "forest-bathe" pretty well anywhere there are trees, even in urban parks." 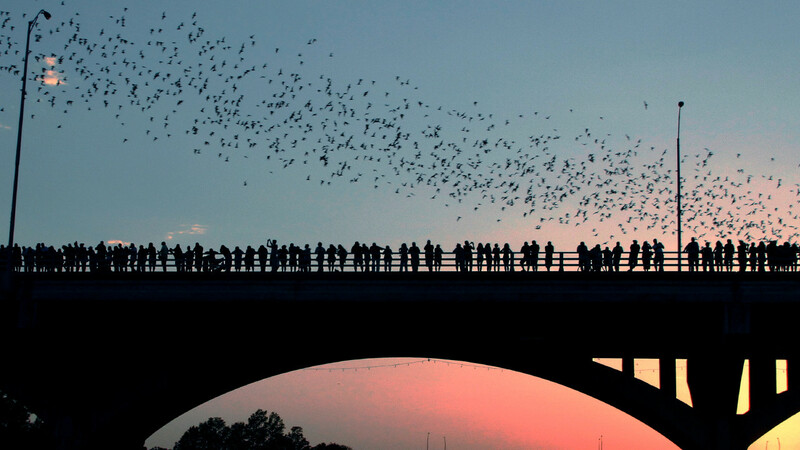 Labels: bats, building design, connection, ecosystem services, fauna, living with, mammals, visit U.S.
“Parking lots are this wasteland – they’re the last thing that gets attention,” Mr. Noble said in an interview. “Here’s a market the size of Alpha Centauri that’s never been tapped.” In 2005, Mr. Noble founded Envision Solar, now the country’s leading developer of solar carports. 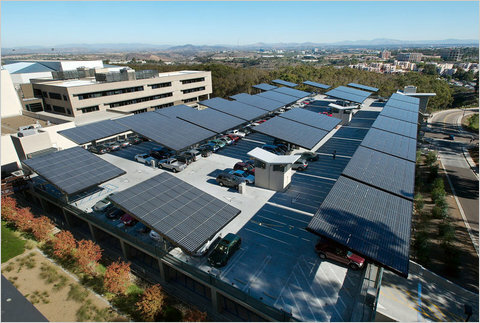 The company’s signature product is “solar groves,” 1,000-square-foot canopies that shade parking lots while generating clean power from an array of photovoltaic panels. The company is now branching out into electric car generation by outfitting its solar canopies with charging stations for plug-in hybrids and electric vehicles. It has developed a pilot project with the Department of Energy’s National Renewable Energy Lab in Golden, Colo., while also working with Coulomb Technologies, a developer of electric vehicle charging stations. D & C's Biocentric Cities post is a monthly post that features options for energy and heating systems that would reduce our demand on natural and non-renewable resources outside the city. A city's consumption is many times its city limit size and impacts nature that we don't even see. My hope is that a city can produce its own energy, heat and clean water within its city boundaries. This movement isn’t about “going back to nature,” but going forward to nature. 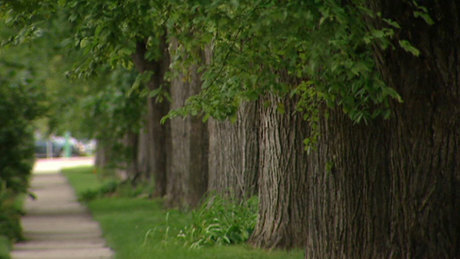 Participants include: traditional conservationists; proponents and producers of alternative energy; physicians (particularly pediatricians) who prescribe time in natural areas and green exercise to patients; ecopsychologists and wilderness therapy professionals; park professionals who help families fulfill their “park prescriptions”; public health professionals and urban designers who work to increase the number of natural amenities near where we live. Other participants are citizen naturalists salvaging threatened natural habitats and creating new ones; community gardeners and urban farmers; organic farmers and “vanguard ranchers” who restore as they harvest; urban wildscapers replacing suburban yards with native species; nature-aware champions of walkable cities and active living; deep green design professionals, including biophilic architects, developers, urban planners and therapeutic landscapers who transform homes, workplaces, suburbs and city neighborhoods – potentially whole cities and their transportation systems – into restorative regions that reconnect us to nature. While so many Canadians and Torontonians are talking about Rouge Park, another great space is being overlooked during the debates and discussions. It seems that Toronto is blessed with a second urban park close to the waterfront. 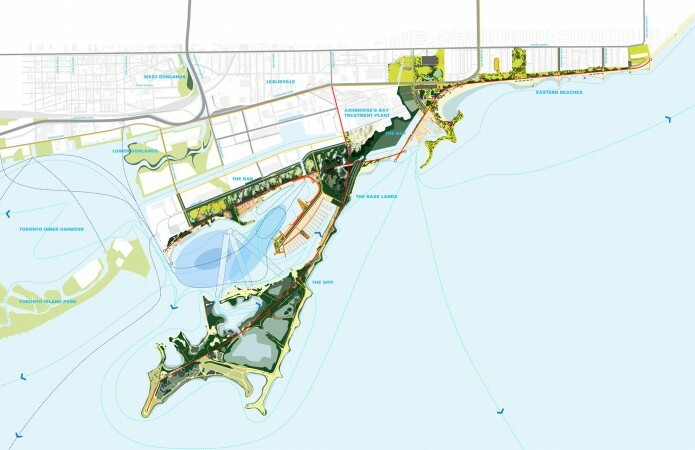 Although its size is approximately 1/10th of the potential 4000 hectares that will become the first national urban park, the Port Lands at 400 hectares is still an impressive size for a centrally located green space. The total size of the Port Lands district is 400 hectare (988-acre) bounded by the Keating Channel/Don River and Lake Shore Boulevard in the north, the Toronto Inner Harbour in the west, Ashbridges Bay in the east and Lake Ontario and Tommy Thompson Park in the south. This extensive, underutilized area presents an unprecedented opportunity for waterfront revitalization. 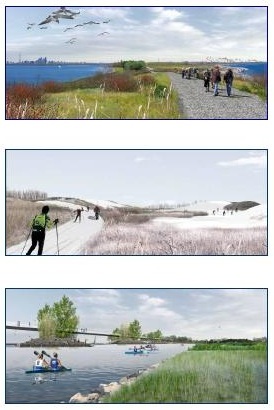 Much of the Port Lands is publicly owned and is within a 30 minute walk of downtown Toronto. The southern portion of the Port Lands is bordered by Lake Ontario and much of it is used formally and informally as recreational space. 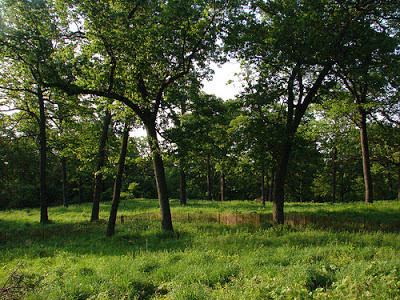 From: "Old oaks face the axe, a major loss to the city’s ecosystem"
"(Eric Davies) explained that the black oak savannah in the park is a rare and precious ecosystem; it has been declared an “area of natural and scientific interest. That designation — ANSI — means it is important to the city, the province, the country, and the continent; of interest to the whole damn world. The periphery around any ecosystem is called a buffer; here, (Juncos which are migratory birds) use it to hopscotch in and out of the park. When the trees are gone, they won’t be able to do that. A larger point: because of the way pollination works, the trees under threat ensure the genetic health of the trees across the street. You would think that, if we protect the park, we would protect that which the park relies on... (Other cities are) protecting their urban forests... making their buffers larger, extending the natural ecosystem... There is a recent study looking at insects and birds in native and non-native trees; the native trees have 50 per cent more biodiversity — insects, birds, fungi, mammals.